I'm so happy to welcome fellow Georgia Romance Writer and Seeker Villager, Walt Mussell, to Seekerville today. Walt's going to explain an amazing opportunity for writers and readers. Walt, thanks for being with us! Debby, thank you for having me. I’m ecstatic to be back in Seekerville! I still remember back in March 2017 when I received an email from Amazon notifying me that my novel, The Samurai’s Heart, had been selected for publication through the Kindle Scout program. I think the word “finally” accompanied the relief that flowed through me. I showed the email to my wife and then sat down and let it sink in. . .I was going to be a published author. So I’m here today to talk about Kindle Scout and the opportunity it provides not only unpublished authors, but ANYONE who wishes to submit their novel for consideration. 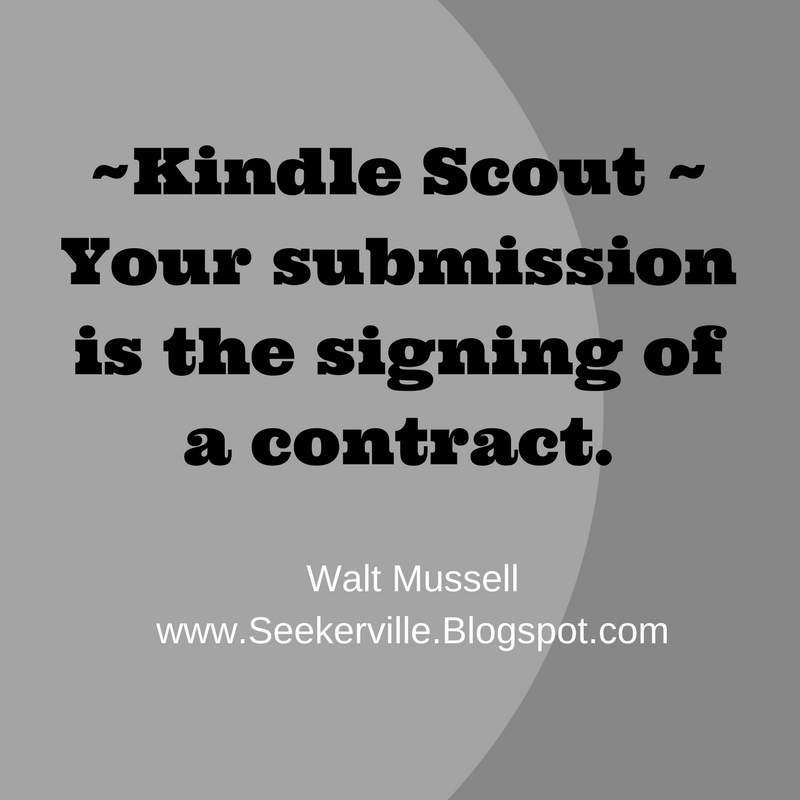 Kindle Scout is an ongoing, reader-driven competition. It can be found at kindlescout.amazon.com. Authors submit an unpublished work to Amazon, along with their bio, a blurb, a tagline, and the answers to a few author-type questions. 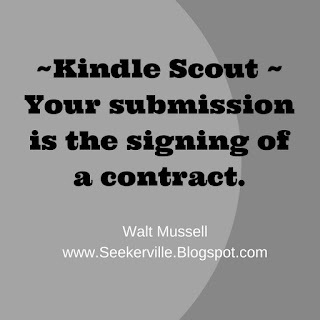 Amazon will review your submission, and then create a campaign page with an excerpt, posting it on the Kindle Scout website. Submissions are never removed from the site, so I’ve posted a screenshot of mine below. The excerpt will be posted for 30 days, along with 150-200 other hopefuls. Readers will vote on the submissions. After the 30-day period expires, Amazon reviews the campaign and notifies you of their decision. The whole process, from submission to notification, lasts no longer than 45 days. For readers, aka Scouters, it’s a great opportunity. If you vote for a book that’s selected by Amazon, you receive a free copy prior to the publish date. Scouters can have only three active votes at one time, so avid Scouters review books that are soon to expire and then choose new ones when their votes open up again. For authors, though, it’s nail biting…and only 3% are chosen. So would I recommend it? The answer is yes. The whys are below. 1) Before you submit to Amazon, you must polish your book. Had I not been selected, I would have self-published my book. It was ready to go. 2) If you self-publish your book, Amazon sends out an e-mail blast to everyone who voted for you, providing instant traction. 3) During your Kindle Scout campaign, you receive a lot of stats from Amazon on things like where your traffic is coming from, how many page views you have, and your time in the “Hot and Trending” category (the top 20 books on the site). The only thing you don’t know is the number of nominations you have. I’ve posted a picture of my page view stats below. So what does it take to be selected? I wish I had a straight answer. The Kindle Scout Winners don’t know for certain either. Is it the “Hot and Trending” list? Is it the number of page views or nominations? Amazon will not comment. My personal thought on the subject is traffic. Kindle Scout is a bit like a literary Netflix. If selected, your e-book becomes exclusive to Amazon. Books that expand traffic to new readers grow the reader base. Books that get readers to spend a lot of time on a selection get noticed by Amazon. In other words, the most important thing remains the same. . .the book. 2) Retention of paperback rights. Easy reversion of other rights. Seekerville, thank you again for having me. Please ask any questions you have about Kindle Scout. I’m giving away four e-copies of my book. I can send these pretty much anywhere in the world. (e.g. I’ve sent books as gifts from the U.S. and people have been able to download them in other countries.) For anyone interested, Amazon has my e-book on sale for $1.99 in the U.S. (link: http://amzn.to/2EXwoh2 ) and Canada (link: http://amzn.to/2Bna4NS). Also, I have a new website at www.waltmussell.com. It just went live this month and I would love visitors, as well as people to sign up for my newsletter. (I was at a conference last November and one of the publishers told me I would need a newsletter of 7000 for them to consider a book like mine. This will take time. 😊) Thank you. Walt is a member of Georgia Romance Writers and Romance Writers of America. 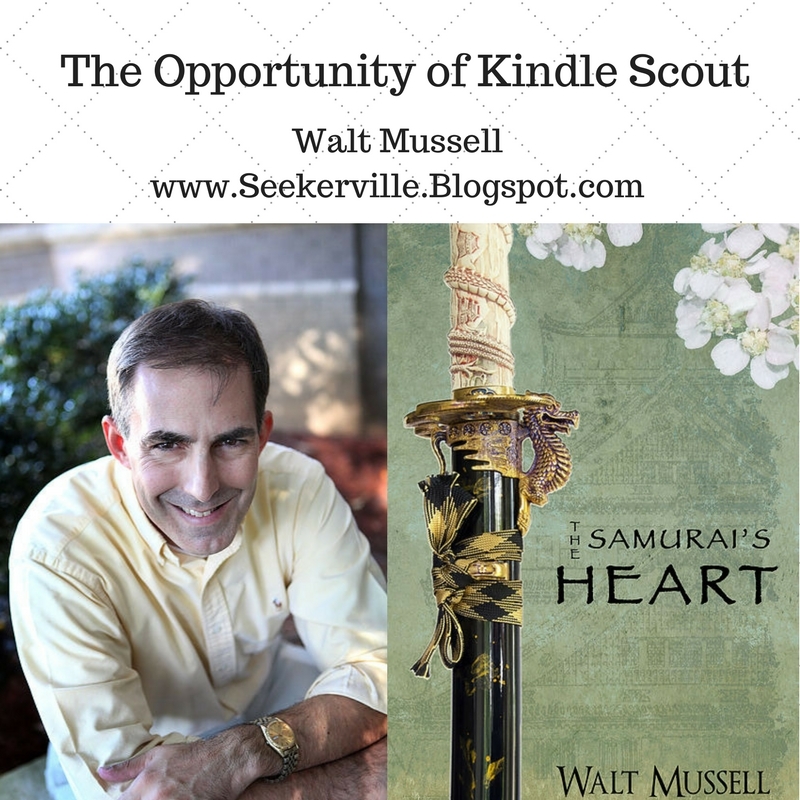 He is a 2017 Kindle Scout winner, which led to the contract for his first novel, The Samurai's Heart. Imagine you're in medieval Japan where your duty to faith can get you killed...or worse. With the death of her older sister and sole sibling, Sen must return home and find a husband to marry into the family swordsmith business. Failure ensures her family's craft, honed through generations, will die. Her father's handsome apprentice, Nobuhiro, would seem the ideal choice for a husband and her parents press the issue. Sen rejects this offer as she wants a Christian husband, difficult as the religion is banned. Eschewing her parents' advice, Sen decides to seek out local Christians to find a suitable match. 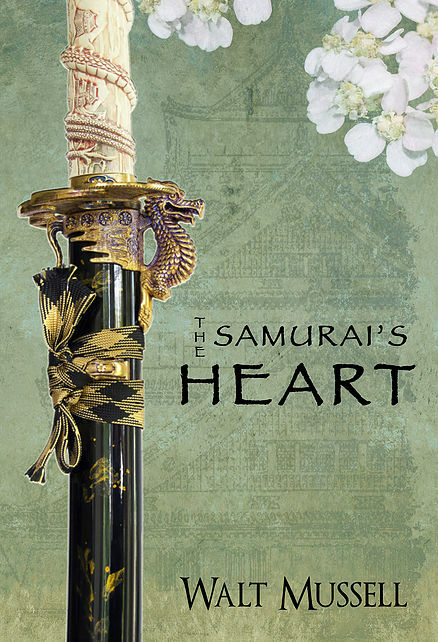 The prodigal third son of a high-level samurai, Nobuhiro seeks to prove his worth to his harsh father by becoming a great swordsmith. But when his master's daughter begins seeking local Christians, he finds he must protect her from the group of anti-Christians that killed her sister. Despite his growing attraction to her, he believes her devotion to her faith reckless. Yet failure to protect her dooms the family he serves. And falling for a Christian dooms reconciliation with his own father, who must enforce the ban. Will faith forge love or will it forge death? I'm so proud of you... first, because you're a great person. Second, because you're tenacious and you know I like tenacious people... in this business, giving up is the kiss of death. Okay, I had no idea how this works... and now I do... and in typical Amazon harvesting methodology, it's pretty darn smart. Thank you for this overview... So does Amazon get rights to your book if you're not chosen by the readers??? 'Splain this to me, friend. I agree with you, Ruthy! So proud of Walt for his hard work that paid off! Only if you are chosen. The ebook rights become exclusive to Amazon, and the ebook won’t appear on another platform. They also get audio rights and translation rights. Audio rights, if not exercised, revert to author after three months, upon request. (I have mine back already.) Translation rights, if not exercised, revert back upon request after a year. (Have to check if I retain ebook rights, if story is in a foreign translation. ) Print rights remain yours. Thanks for this question and answer...I was wondering the same thing! Walt, got it. That makes sense and I am over the moon loving this opportunity for people.... because not everyone sees some stories as the "gems" they are... and in the end, it's the reader's opinion that matters. This is a great post, my friend. Thanks, Ruthy. Had I not published with Kindle Press (via this contest), I would have taken the plunge and self-published. For a newby like myself, without a fan base, that makes marketing an even bigger challenge. Thanks for the coffee! I'm pouring a cup! 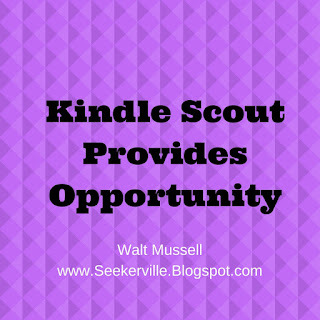 Walt, thanks for sharing all you've learned and experienced with Kindle Scout. I teach a writing class at my church and I know some of those folks will be interested in this opportunity! Villagers will be too. Like Ruthy, I wasn't sure how the program worked. You've done a great job with your explanation and sales pitch! Kindle Scout is something to consider for those who have a story they want to share with the world. Walt, I hope you'll also mention the recent good news you've had concerning The Samurai's Heart! As Ruthy said in her comment, we're so proud of you! Your hard work paid off with publication!!! Woot! My good news is that I finally achieved bestseller status in both the U.S. and Canada last weekend. Amazon ran a BookBub ad on my behalf. I was #1 in Religious/Inspirational Historicals in the U.S. I was #1 in Canada in Historical Romance. WALT!!!! HAPPY DANCING FOR YOU!!!!! You have no idea how happy this makes me.... YIPPEE!!!! To celebrate Walt's success, I've brought cranberry scones, banana bread, fresh fruit and rice cakes! Enjoy! Reaching for a rice cake and adding a little soy sauce! YUM! Ooo, thank you, Debby. One of those cranberry scones will be just dandy with my second cuppa tea. Love cranberry scones! I buy mini-scones at Sprouts that are cranberry-orange. Oh, they're amazing! And perfect snack size. I love Sprouts, Missy! Stopped there today and got six bags of produce...wonderful fruits and vegetables for $37. #socheap! Rice cakes???? I get the scones. I get the fruit. Did they run out of biscuit flour? (Ruthy walks away, shaking her head, because she clearly expected more from her Southern contingency.... then thinks maybe MISSY will bring pecan pie. Or Patti Jo might come by with peach something!!!! And Ruthy is suddenly breaking into her "gonna be happy" dance!!! "My good news is that I finally achieved bestseller status in both the U.S. and Canada last weekend. Amazon ran a BookBub ad on my behalf. I was #1 in Religious/Inspirational Historicals in the U.S. I was #1 in Canada in Historical Romance." For Amazon to run a BookBub ad is huge! Lots of sales to propel you to #1 in the US and Canada! I'm happy dancing for you! That's great news!!!! Congratulations, Walt! Oh, how exciting!! Love those BookBub boosts!! Welcome back to Seekerville, Walt, and mega congrats! I never heard of Kindle Scout until I read your post, but that's really cool. Thank you for sharing this. Very informative. Thanks, Mindy. It's a great opportunity, particularly for people that don't fit a defined niche. Wow! Walt! What great success you're having with your book! I remember when you were wondering if a publisher would ever take a chance on an historical story like yours...and you worked until you found your spot! Like Ruthy said, tenacity is SO important! So, if I'm understanding Kindle Scout correctly, there's a lot of reader input into whether a book gets published or not, right? That's big! I can see traditional publishers following what is published on Kindle Scout to keep their finger on reader trends, and I can also see books catching readers' attention that wouldn't get noticed otherwise. Thanks for the information, and congratulations again!!! So happy for you! Great points, Jan--keep a finger on reader trends and books that wouldn't get noticed otherwise. To Jan and Karen, I place more information on the latter, though the former is important, too. Also the PR you got from the BookBub ad is so amazing! That alone would be worth all the hard work. This is really neat. Thanks so much for sharing. And congratulations! Thanks for all the information on Kindle Scout! You've given me lots to think about. Also, congratulations on The Samurai's Heart! Jackie, thanks for stopping by today! Hope all is well with you! One thing that really struck me is how great your blurb is. I think that could have had a huge impact on your success (like what Lincoln said). You know, something you said made me think you had your cover made before you submitted. Who did it for you? It's gorgeous! Missy, I agree with you about the blurb. I'm doing a workshop for a couple of writing groups about why and how to write a good blurb. They're hard to write, and I certainly didn't realize how important the blurb was when I wrestled with my first one. Agreeing with Missy and Karen about the blurb. We all struggle writing them. Maybe I should only speak for myself. I struggle writing blurbs! Karen are you giving a blurb writing workshop? If so, I'm impressed! Missy, Karen, and Debby, thank you for the kind common. On my blurb, I did have some assistance from a Seeker Emeritus. The cover was designed by Rogenna Brewer, who I may beg out of cover design retirement for items in the future. I'm trying to finish the draft on a prequel and am working on my sequel. Walt, I plan to use Rogenna so I bet if you plan ahead maybe she’ll do another for you. :) I’m glad to hear she did it! I love her work. Walt, there's so much to celebrate in your post! Congrats on all the good things happening for you and your book. Thank you for sharing this great information. WALT!! CONGRATULATIONS again on your wonderful book! I enjoyed it so much! This info on the Amazon Scout program is intriguing. Interesting that you don't know exactly how the selection process works. But what an opportunity! And the 7K newsletter subscribers thing? It blows my mind when an editor tells you something like that. New authors are already supposed to have that kind of following??? Maybe for nonfiction if they have a speaking platform, but not really feasible for a first-time novelist. Anyway, congrats again, and all the best for your next books!!! Guess who doesn't have a newsletter? ME!!! Must get started. There never seems to be enough time. Anyone else feel that way? Myra, thanks. The KS Winners have a private group on FB where we discuss writer challenges. We don't quite know either what's out there. We only know that the program is getting more popular, so that recent winners seem to have higher page views than prior winners. As for the comment of the editor from the publishing house, it had nothing to do with my being a first-time novelist. Instead, it was my comps (comparables). Christian publishing houses turned me down because they couldn't see where I would fit. For me, the closest comp to my novel is Shogun by James Clavell and in that book the heroine dies. (Hardly a comparable for a HEA. :-)) I've been thinking a lot about comps as GRW's speaker last weekend was from the Knight Agency and she brought it up. There's some wonderful Asian-based historical romances out there from authors like Weina Dai Randel and Jeannie Lin, but there writings aren't Christian fiction. The editor wants to see 7000 as it's an attitude of less risk. Thank you for this informative post today, Walt, and CONGRATULATIONS on your book! I was not familiar at all with the Kindle Scout program and I appreciate your explanations---sounds like a great opportunity for many. Hi Patti Jo! I didn't know about the program either until Walt shared the information. I hope this blog provides a way for others to get their work in front of readers. Patti Jo, I agree. It's a great opportunity for many people. Patti Jo... did you forget something? Like... something peachy? Don't leave me hangin', woman. Thanks, Patti Jo! I'm eager to try your Peach Crumble! Thank you for such an informative post. I will definitely look into it. One question I have, must you already have a cover as well to submit your story to Kindle Scout and are you competing with all stories posted for that 30 day period or in a specific subgenre? Thanks again for being so generous with your information. Great questions, Anna. I'm interested, as well. Anna, you're submitting a book that you could turn around and self-publish almost immediately is Amazon turns you down. So, yes, the cover and everything else needs to be ready. You are not competing with a specific subgenre, though you will list your book in more than one genre to draw page views. Youre competing for eyeballs with everyone on the site at the same time you are. 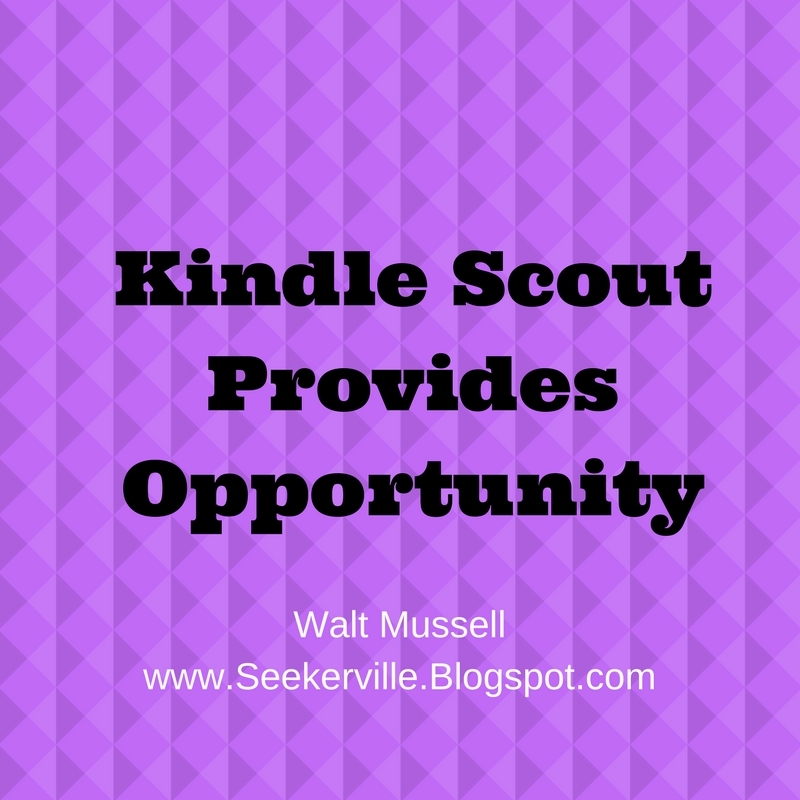 Walt, thank you for sharing about the Kindle Scout Program. Congratulations on your book! Thanks for stopping by and leaving a comment, Caryl! You're in the drawing! Walt, don't you have two more stories in this series? If so, do you plan to self-pub them? Do you have an estimated date for publication? I'll look forward to reading the sequel! WALT!!! I never, ever heard of Kindle Scout, so your post captured me from start to finish! What a GREAT idea!! And SUPER CONGRATS on being in the coveted 3% -- WOW!! I have a question for you. I am hoping to write a short secular novel and I'm game to experiment with anything new to promote it. Would you recommend that to a multi-pubbed author like myself? Good question, Julie! Notice that one of Walt's quotes is from Cristiane Serruya, a USA Today bestselling author. Wonder if she did Kindle Scout first or after her bestseller released? Julie, I was going to mention Cristiane as well. Are you going to write it under a different name. or will it still fit in with your brand? Congratulations, Walt! So happy for you! And thanks for sharing your publishing experience. Hi Laura, so glad you could stop by today! Wasn't Walt's blog interesting? He provided so much new information...and writers always like to learn something new! Thanks, Laura. It has been a learning experience. Walt, sorry to be a late party goer. The baby bear is in town and we went to look at rescue kittens. What a terrific explanation of Kindle Scout. I'm anxious to try this venue on some of my indie works. I don't know how you do what you do with a full time job and shuttling back and forth to high school and college activities with your kids. Plus you do Kindle Worlds as well. Tina, thank you! It is a good place for anything the market might find speculative. Tina, you're so right. Walt is a great provider for his family and a super dad. Plus, an amazing writer! Congratulations to you, Walt! Thank you for explaining the ins and outs of Kindle Scout. Walt, until I read your post, I knew nothing about Kindle Scout. Thanks for the info! Barbara, many of us were in the dark. So glad Walt provided info about this interesting program that's a boon for writers AND readers! Barbara, it's a really good program, and the number of readers is growing. And a good thing readers can do is to spend time with the books where campaigns are about to expire. it increases the amount of great books one can win. Oh my gosh, Walt! Mega congratulations on your writing accomplishments! It's always inspiring to read good news like yours. Thank you for sharing! Thanks, too, for such a clear, concise explanation of the Kindle Scout program. You've made me aware of an option I hadn't considered before. Nancy, so glad you stopped by to learn more about Kindle Scout. Many of us are amazed at this opportunity. Hope all is well. Nancy, if you choose to try it, good luck. It has been an eye-opening experience. Walt, thank you so much for this post on Kindle Scout. I hadn't heard of it. This was very interesting. Thanks for sharing! Congratulations on your book! Thanks, Sally! Glad you enjoyed the post. Such an informative post, Walt! Thanks so much for the information! Nicki, so glad you could stop by tonight! Hope all is well! Thanks, Walt, for being with us today and for providing an informative post about Kindle Scout. We're all thrilled about your success and appreciate you sharing what you've learned with us! Keep us posted on your sequel and other writing endeavors! And, again, thanks for being with us. Thank you for sharing your experience! I've given some thought to the Kindle Scout program before but have dismissed it because I didn't think I'd have the following to boost the page views. I get the sense though from reading this, that it sort of has a life of its own beyond what self-promotion can do. Does that sound correct? Yes, you have a lot of people reading it, whether they like your genre or are just looking at the books that have campaigns ending soon. However, what I did to maintain interest was to ask friends to post at different time throughout the campaign to draw readers. Congratulations and thanks for explaining about Kindle Scout. I will head over to your web page and sign up for your newsletter. I wish you continued success! Walt, I'm sorry I'm so late to the party! I was out of town AND I had computer troubles! What a great look into Kindle Scout I had no idea it even existed! Congratulations on having your book chosen, and thanks for sharing your experience here! Your article was encouraging, informative, and helpful. Thanks! I REALLY enjoyed your book by the way. And hope to see you again at the Art of Writing Conference in Nashville later this year. What a blessing! KC, I enjoyed meeting you as well, and I also hope to make a return trip to Nashville. Thank you for the kind comments on my book!